Luckily for me, cooking and baking always seem fresh. The start of a new project — whether it be constructing a multilayered cake or just getting breakfast on the table in the morning (or, rather, in a pack for the train) — feels a little different every time; it’s like a break from the reality of that day, that moment. It doesn’t matter that I’ve been actively interested in cooking for several years; I will always be mystified, humbled by the way flour, butter, and water make layers of flaky pastry and even how just a ½ teaspoon of mustard can emulsify two competing forces — oil and acid — so seamlessly. The fact that I know the science behind these things doesn’t make them any less wonderful; the process feels new and beautiful every time. Despite this, I have this annoying need to tinker. A neurotic tick. (This probably doesn’t come as a surprise.) I cannot leave well enough alone. Not just in the kitchen. I’ll look back at the bed I made several times, smoothing out the wrinkles, tightening the corners. It’s a way to regain control when life seems so very out of control. It’s a way to make everything a game, make the mundane fun. With food, it’s more about that second point. When I use a cookbook recipe, I usually find myself saying things like, “hmm, that sounds great, but it’ll be too sweet; how much sugar can I subtract before my measures affect browning and coagulation?” or “ooo, that flavor combination sounds lovely — but it would be even better with y instead of x.” For fun. To learn. And I usually like what happens. I liked lining the bottom of this cream tart with white chocolate that I caramelized. I liked coming up with variations on these delicious bites. Which is why I wasn’t going to make this cake. I wasn’t even going to purchase the book from which it came — I didn’t, in fact. I got Baked Elements as a gift from my mother. She knows that I own the first two books in the Baked trilogy (as evidenced by last week’s post) and assumed I would want to add it to my collection when she saw it at a store. (If only she had bought me this, which I need STAT.) Truth is, I didn’t. While many of the recipes in Matt Lewis and Renato Poliafito’s little tomes are absolutely crave worthy, many are just too candylike for my tastes. I don’t like the way the ingredients are measured and the directions laid out. And I just don’t need another baking book. And I didn’t. 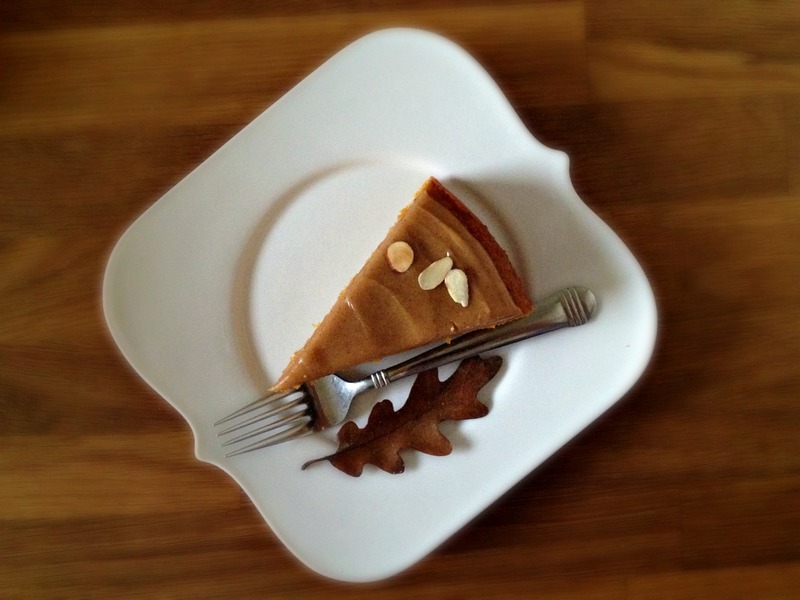 And the cake itself is the best pumpkin cake I’ve ever had. The almond flour gives it a subtle nuttiness, but what really does it for me is the spice. It’s spiced, of course, but it’s spiced with restraint. I think we’ve come to think that pumpkin tastes like spices but, and if we think logically, pumpkin tastes like pumpkin…a sweet vegetable. AND, there’s no vegetable oil. It’s made using the standard butter-creaming method, which means it’s light and fluffy, a revelation for pumpkin cakes and breads which are usually oily, dense, and even wet. But the topping was the part I worried about. And, well, the topping just didn’t do it for me. Not one bit. I was so excited to see that it wasn’t cream cheese frosting. Pumpkin and cream cheese is a favorite of mine, but it’s so darn ubiquitous. I was excited to try this unique new take on pumpkin, so I was sad when it just didn’t hit the spot. This frosting — which is really more of an icing — is too rich, too heavy. It’s smooth, but it coats the mouth unappealingly. Its flavor is too strong, and it overshadows that beautiful, beautiful cake. I never post anything I haven’t liked. I want the reader to feel confident that they should make something I’ve posted and that he or she will enjoy it. But this cake base is too incredible not to share. And, maybe you’ll like the topping. Not everyone’s tastes align with mine, of course. I’m going to make it again. I have an idea in the works for the topping. It needs something lighter and brighter but nutty still. I need to tinker. I need to go with my gut. I ended up using half the frosting I made and still found it overwhelming. If you want to try the frosting, I recommend halving the recipe, but that’s a personal choice. For the cake: Position an oven rack in the middle position and heat the oven to 350 degrees. Grease a 9-inch round cake pan, line the pan with parchment paper, and grease and flour the parchment. In a medium bowl, whisk together the all-purpose flour, almond flour, baking powder, baking soda, salt, cinnamon, ginger, nutmeg, and cloves; set aside. In the bowl of a sand mixer fitted with the paddle attachment, beat the butter, granulated sugar, and brown sugar on medium speed until light and fluffy, about 3 minutes. Add the pumpkin puree and beat until just incorporated. Add the egg in two additions, beating well after each addition. Scrape down the bowl (making sure to scrape the bottom) and mix again for 30 seconds. Add the flour mixture in 3 parts, alternating with the buttermilk, beginning and ending with the flour mixture. Scrape down the bowl (again, making sure to scrape the bottom), and beat for a few more seconds. Scrape the batter into the prepared pan and bake until a toothpick inserted in the center of the cake comes out clean and cake registers 210 degrees, 40 to 50 minutes. Transfer the pan to a wire rack to cool for at least 20 minutes. Run a small knife around the sides of the pan to loosen and then turn the cake out of the pan, remove the parchment from the bottom, and invert. Cool completely before frosting. For the frosting: Place the almond butter, butter, 2 tablespoons almond milk, 11/4 cup confections’ sugar, and salt in a food processor and pulse until the frosting becomes shiny and smooth. (This could take a lot of pulses.) For a looser frosting, add 1 to 2 more tablespoons of almond milk; for a thicker frosting, add up to 1/2 cup confectioners’ sugar. Pulse until frosting comes together again. To assemble: Transfer the cake to a serving platter. Using an offset spatula, spread the frosting evenly across the top. 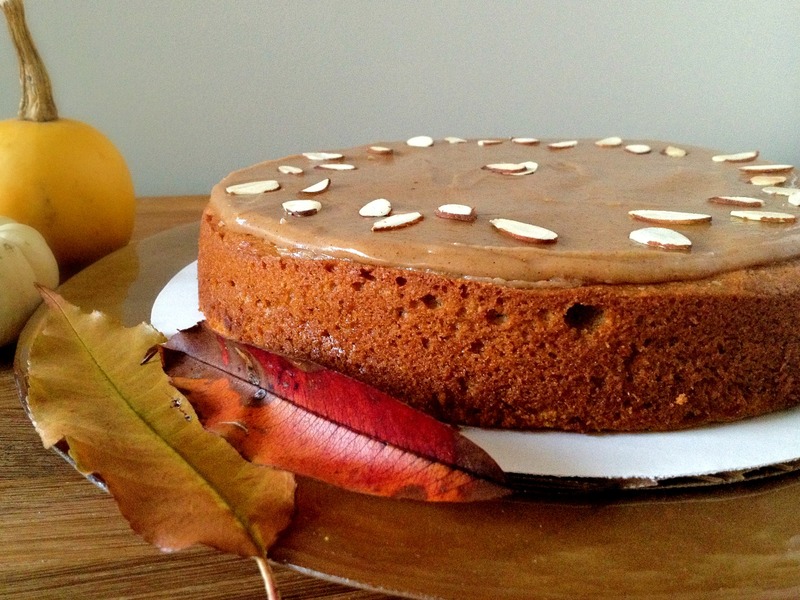 Sprinkle the cake with sliced almonds. Store at room temperature for up to 3 days. I know exactly what you mean when it comes to perfectionism…or the impossibility of attaining it ;-) This looks pretty damn close though – love the sound of all those flavours and I even think the icing looks pretty good, although am intrigued to see what you come up with as an alternative. 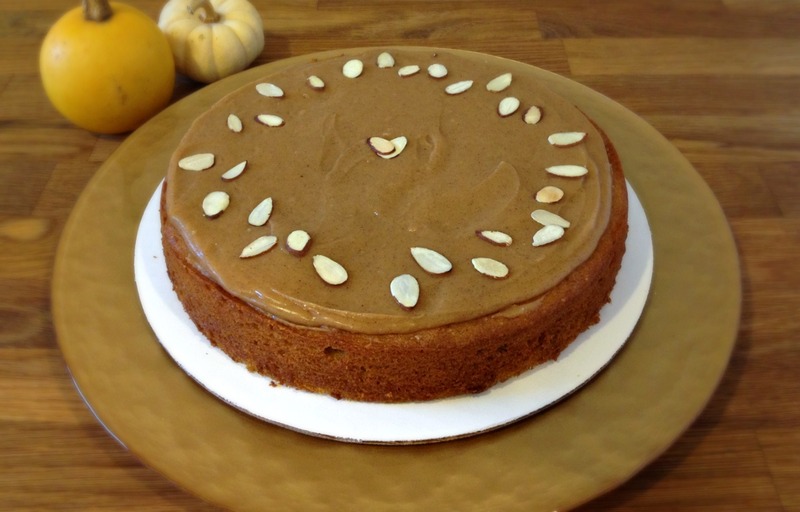 The almond-pumpkin combo certainly is wonderful…it just needs a little refining. It might have to wait until next autumn. As much as I understand your need to tinker (as I do it myself ALL the time), I tend to try out a recipe as written before I make adjustments. I guess I want a baseline to start out from. That is a beautiful cake. I wish I liked almond flavor more. I feel the same way – I have a hard time following a recipe exactly! It’s easier for me with baking though, because I don’t do it enough to feel confident in changing the original recipe. Sounds like this one was a keeper! I need Jerusalem stat too (and Bouchon Bakery). But I also have Baked Elements on my wishlist. This cake sounds lovely but… maybe a different icing… or perhaps some chocolate ganache would help. I know I’m still just dipping my toe into the pumpkin-chocolate pool, I think this would actually be a particularly good cake for chocolate ganche! Lovely cake. 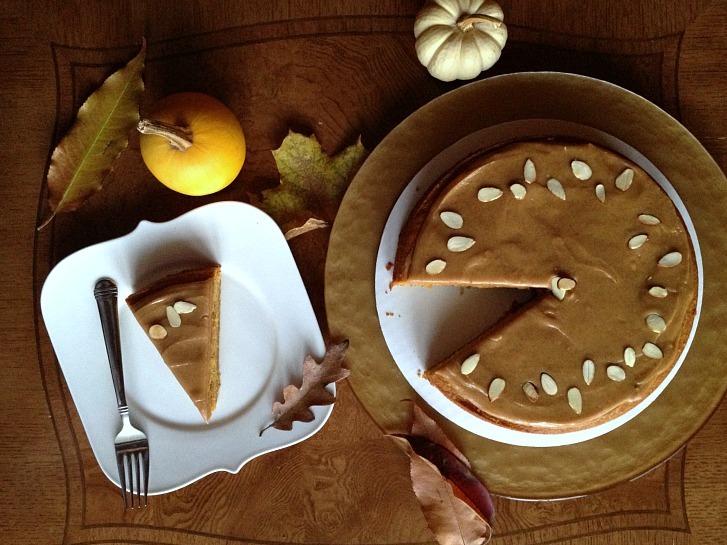 I like that you tried a new variation with pumpkin, since it always seems to be done the exact same way – it’s just too bad it didn’t turn out to your liking! Props too for sticking to the recipe, I struggle with that, and often times lose the battle. I like to put my mark on everything! Looks absolutely perfect to me!